Recently I posted my letter to my Secret Santa on this blog (See Dear Secret Santa). I had told my Secret Santa that the reason I was a little late in making my Christmas Wish List known was because, when it came down to it, I really didn’t want for anything; that I really had everything I needed. I did list some suggestions anyway, to give my Secret Santa something to go on, but the truth is that I had no strong desires for anything. Honestly, I have felt, and still do feel, blessed to be in a position of having my needs met in my life. 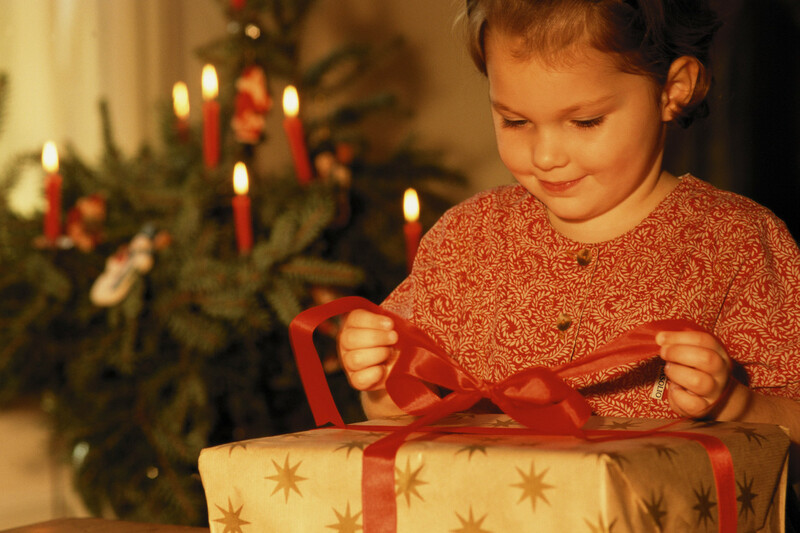 To have a home, a family, food and clothing – all these are blessings that bring me contentment. I stumbled across this gift a few months back while I was searching for a graduation present and it really spoke to me. I wanted to purchase it for myself as a reminder that when I got frustrated with the little things to remember what was truly important to me. When I did that, I found myself realizing that the things that were stressing me out were really so inconsequential in the big picture and that truly I have so much to be grateful and happy about in my life. I have a husband that I adore and a family that loves me and truly THOSE are the things that I really couldn’t live without. I never did end up buying it, but the minute I read your Secret Santa blog I thought of it again. I liked how you spoke of not truly wanting for anything because when it came down to it, you really have everything you need to make you happy. Sure, there are plenty of things that we would like to have (believe me, I know that better than most) but it made me happy to read that you genuinely don’t want for anything because at the end of the day you have everything (and everyone) you need to be happy. The gift Thayer gave me is this silver Kathy Bransfield necklace. 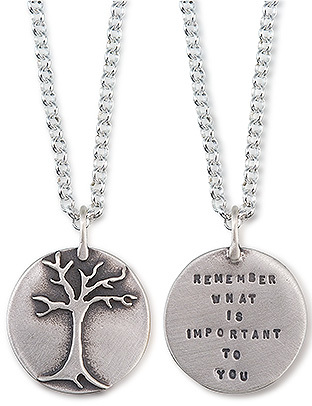 The pendant shows the image of a tree on one side and the words “Remember what is important to you” on the other. I like the tree as a symbol of nature and the Earth, of being rooted and at the same time reaching skyward. It reminds me, too, of family and of remembering where I come from and of watching as my family continues to grow and branch out. The phrase, of course, is a simple prompt, reminding me to stay grounded in the things that matter most in life. It is really a very meaningful pendant. I must say that, while I will cherish this simple and beautiful necklace, to me the real gift is Thayer’s heartfelt letter. In her thoughtful words I feel her understanding and a connection. Thayer “gets it”. I appreciate that she shared her experience and insight with me. She may not realize it, but there will be many days to come when I will need to remind myself of what is important. Life is consistently challenging, even when all your needs are met and you are not wanting for anything. So thank you, Secret Santa, for sharing your heart and knowing best what to give me!